5 Grand Duke Ludwig I of Hesse and by Rhine 1753 1830 Landgravine Luise of Hesse-Darmstadt 1761 1829 Ludwig was previously Landgrave Ludwig X of Hesse-Darmstadt who on 13 August 1806 assumed the title Grand Duke of Hesse and on 7 July 1816 by the Congress of Vienna was further recognised as the Grand Duke of Hesse and by Rhine (as Ludwig I). Ludwig I and Luise were first cousins their respective fathers were brothers. 5.11 Grand Duke Ludwig III of Hesse and by Rhine 1806 1877 Magdalene Appel 1846 1917 Magdalene was created Baroness von Hochstädten on 9 June 1868. 5.121 Grand Duke Ludwig IV of Hesse and by Rhine 1837 1892 Princess Alice of Great Britain 1843 1878 See 1.3 - Alice died after contracting diphtheria from her son Ernst (he subsequently made a recovery). Birth Registration of Princess Alice. A detailed report on the marriage of Grand Duke Ludwig IV and Princess Alice. Marriage Registration of Grand Duke Ludwig IV and Princess Alice. 5.121 Grand Duke Ludwig IV of Hesse and by Rhine 1837 1892 Alexandrine von Kolemine 1854 1941 Grand Duke Ludwig secretly married Alexandrine von Kolemine, known as Madame de Kolemine on in Darmstadt on 30 April 1884 on the same day as his daughter Victoria married Prince Louis of Battenberg. Under pressure from Queen Victoria the marriage was speedily annulled and the marriages dissolved on 9 July 1884. As part of the annulment settlement Alexandrine was provided with an annuity of forty thousand marks and created Countess Romrod. Alexandrine was born Alexandrina Hutten-Czapska and was firstly married to Alexander Kolemine the Russian chargé d'affaires in Darmstadt. Following her quick annulment from Ludwig she married thirdly another Russian diplomat Baron Bacheracht on 18 May 1893. Prince Louis was created 1 st Marquess of Milford Haven and the family name changed to Mountbatten in 1917. He became a British Subject in 1868 at the age of 14 years. A detailed article on the wedding of Princess Victoria and Prince Louis. 5.1214 - QVD Grand Duke Ernst Ludwig of Hesse and by Rhine 1868 1937 Princess Eleonore "Onor" of Solms-Hohensolms-Lich 1871 1937 Grand Duke Ernst lost his throne on 8 November 1918 when Hesse was proclaimed a Republic. Report on the wedding of Ernst Ludwig and Eleonore. Ernst died on 9 October 1937, the following month on 16 November his wife Eleonore together with their son Hereditary Grand Duke Georg (and his wife Princess Cecilie and two sons) were killed in an aeroplane accident near Ostende. 5.12141 - QVD Princess Elisabeth of Hesse and by Rhine 1895 1903 Elisabeth died of typhoid fever. However it was reported in various newspaper that Elisabeth died from oyster poisoning whilst a guest of Emperor Nicholas II of Russia. 5.12143 - QVD Hereditary Grand Duke Georg Donatus of Hesse and by Rhine 1906 1937 Princess Cecilie of Greece and Denmark 1911 1937 See 16.73 - Hereditary Grand Duke Georg his wife Princess Cecilia, two sons and mother Princess Eleoner were killed in an aeroplane accident near Ostende. Cecilia was eight months pregnant at the time of the crash and the baby's body was discovered amongst the wreckage. The party were on their way to Croydon Airport to attend the wedding of his brother Prince Ludwig of Hesse and by Rhine to Margaret Geddes. A total of eight passengers and three crew members were killed in the crash. Further details of the eight passengers who were killed in the crash. The Evening Independent of 23 November 1937 (a Florida based newspaper) included a report from the newspaper Midi-Journal which had said a Belgian inquiry into last week's airplane disaster at Ostend indicated that the pilot attempted to land because the Archduchess of Hesse bei Rhein , one of the passengers, was giving birth to a baby. The body of the new-born infant was found in the wreckage.. It was also reported a search of the immediate crash area led to the recovery of jewellery which had been flung from the baggage of the Grand Ducal party. On 20 December 1937 it was reported that the superintendent of Ostend airport is on a charge of manslaughter following the crash possibly due to the non dispatch of a radio message to the airplane pilot to travel direct to Croydon due to fog conditions. I'm not aware of the outcome of this manslaughter charge. 5.12144 - QVD Prince Ludwig "Lu" of Hesse and by Rhine 1908 1968 Margaret "Peg" Geddes 1913 1997 The Ducal House of Hesse and by Rhine came to an end on the death of Prince Ludwig. Ludwig had previously adopted his distant cousin Landgrave Moritz of Hesse-Cassel in 1960 and by a family pact Landgrave Moritz became Head of all the House of Hesse. Margaret "Peg" Geddes was the daughter of Sir Auckland Campbell Geddes, 1st Baron Geddes, her brother Alexander Campbell-Geddes was married to Altgräfin Marie Anne of Salm-Reifferscheidt-Krautheim and Dyck. Ludwig and Margaret were married on 17 November 1937 just one day after the tragic death of Ludwig's brother the Hereditary Grand Duke Georg Donatus of Hesse and the Rhine and his family in an aeroplane accident near Ostende. The Hereditary Grand Duke and his family were on their way to Croydon Airport to attend the wedding of Ludwig and Margaret. A reflection on the terrible tragedy curse surrounding the Hesse and the Rhine family. Obituary: Princess Margaret of Hesse and the Rhine. The marriage registration of Prince Ludwig and Margaret Geddes. A copy of the original marriage certificate of Prince Ludwig and Margaret Geddes. 5.1216 - QVD Princess Alix of Hesse and by Rhine 1872 1918 Emperor Nicholas II of all the Russias 1868 1918 See 4.9131 - Alix took the name "Alexandra Feodorovna" on her marriage. Report on the wedding of Alix and Nicholas Alexandra along with her husband Nicholas and five children were executed in the cellar of the "Ipatiev House" in Ekaterinburg on 17 July 1918. 5.122 Prince Heinrich of Hesse and by Rhine 1838 1900 Caroline Willich gen. von Pöllnitz 1848 1879 Caroline was created Baroness von Nidda on 28 February 1878. 5.122 Prince Heinrich of Hesse and by Rhine 1838 1900 Emilie Hrzic de Topuska 1868 1961 Emily was created Baroness von Dornberg on 14 September 1895. 5.14 Prince Alexander of Hesse and by Rhine 1823 1888 Countess Julie von Hauke 1825 1895 Julie von Hauke was created Countess of Battenberg on 5 November 1851 (a week after her marriage to Alexander) and Princess of Battenberg on 26 December 1858 by her brother-in-law Grand Duke Ludwig III of Hesse and by Rhine. 5.141 Princess Marie of Battenberg 1852 1923 Prince Gustav of Erbach-Schönberg (1 st Prince of Erbach-Schönberg) 1840 1908 Gustav of Erbach-Schönberg received the Hessian title of Prince on 18 August 1903, hitherto his family had been Counts of Erbach-Schönberg. Marriage registration of Imma and Neil. Death Registration of Imma "McEacharn". 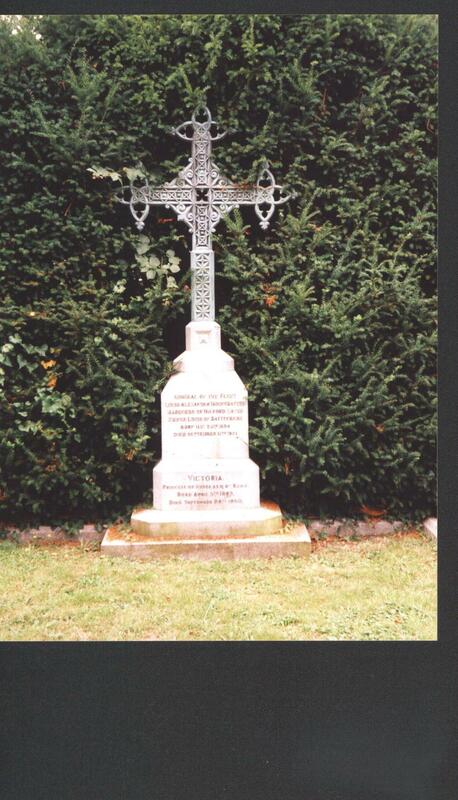 Grave of Imma in the grounds of St. Catherine’s, Netherhampton, Wiltshire, England. 5.14113 Prince Wilhelm Ernst of Erbach-Schönberg 1904 1947 Countess Alexandra von Schlitz genannt von Görtz 1910 1989 Wilhelm died in an internment camp at Krassni-Lubsch, Russia. There were rumours in 1930 that the future Queen Juliana of the Netherlands would become engaged to Wilhelm, obviously nothing came of this. 5.14114 Princess Helene Sophie of Erbach-Schönberg 1907 1979 It was reported in 1935 that a twenty year old Princess Helene zu Erbach Schonberg wanted independence and lived in a small flat with hopes of earning her own living as a book-binder. Although there are discrepancies between the actual age of Helene Sophie and that mentioned in the report it does appear most likely the report is referring to Helene Sophie. 5.1412 Stillborn Son 187? 187? 5.1414 Prince Victor of Erbach-Schönberg 1880 1967 Countess Elizabeth Szechenyi de Sarvaret Felso-Videk 1888 1977 Prince Victor served as the German ambassador to Greece until the occupation of the country by the Axis Powers in April 1941. It was Prince Victor who handed a note to the Greek Prime Minister Alexandros Koryzis on 6 April 1941 to coincide with the assault by Germany on Greece. The Note asserted that Britain and France forced the war on Germany. Alexandros Koryzis who had only been Prime Minister since 29 January 1941 shot himself on 18 April 1941 rather than face the German entry into Athens. 5.142 Prince Louis of Battenberg 1854 1921 Princess Victoria of Hesse and by Rhine 1863 1950 See 5.1211- Prince Louis was created 1 st Marquess of Milford Haven and the family name changed to Mountbatten in 1917. He became a British Subject in 1868 at the age of 14 years. An interesting little article regarding Prince Louis. 5.1421 - QVD Princess Alice of Battenberg 1885 1969 Prince Andrew of Greece and Denmark 1882 1944 See 16.7 - Alice was profoundly deaf having been born with a ear defect (thickness of the "Eustachia" tubes). A report on the funeral of Princess Alice. 5.1423 - QVD George Mountbatten (2nd Marquess of Milford Haven) 1892 1938 Countess Nadejda de Torby 1896 1963 See 4.9832 - George Mountbatten was previously Prince George of Battenberg until the family name was changed to Mountbatten in 1917. 5.14232 - QVD David Mountbatten (3rd Marquess of Milford Haven) 1919 1970 Janet Bruce 1937 Marriage Registration of David Mountbatten and Janet Bruce. 5.142321 - QVD George Mountbatten (4th Marquess of Milford Haven) 1961 Sarah Walker 1961 Birth Registration of George Mountbatten. Lord Ivar Mountbatten and Penelope Thompson were divorced in 2011 and in 2016 he announced he was gay and in a relationship with James Coyle. Lord Ivar and James Coyle are due to get married latter part of 2018 with Lord Ivar's ex-wife Penelope due to give her former husband away at the ceremony. 5.1424 - QVD Earl Louis Mountbatten of Burma 1900 1979 Edwina Ashley 1901 1960 Earl Louis Mountbatten was previously Prince Louis of Battenberg until the family name was changed to Mountbatten in 1917. Earl Louis and his grandson Nicholas Knatchbull were killed by the IRA. An interesting article on Earl Mountbatten published just after his death. Birth Registration of Edwina Ashley. 5.14241 - QVD Countess Patricia Mountbatten of Burma 1924 2017 John Knatchbull (7 th Baron Brabourne) 1924 2005 Lord Brabourne's mother the Dowager Lady Brabourne was seriously injured by the bomb blast which killed Earl Louis Mountbatten and his grandson Nicholas Knatchbull and she died the following day. Birth Registration of "Patricia Mountbatten. Marriage registration of "Patricia Mountbatten and John Knatchbull (Baron Brabourne). An out of date Web Page on the "Knatchbull Communications Group" which gives a brief "Who We Are" on Lord Brabourne and his four sons. 5.142411 - QVD Norton Knatchbull (3rd Earl Mountbatten of Burma) 1947 Penelope Eastwood 1953 Birth registration of Norton Knatchbull. So Lord Brabourne was living in a barn when he returned to Broadlands. 5.142418 - QVD Nicholas Knatchbull 1964 1979 Nicholas and Timothy Knatchbull were twins. 5.142422 - QVD Ashley Hicks 1963 Allegra Tondato 1960 It was reported in May 2009 that Ashley and Allegra have separated. 5.142422 - QVD Ashley Hicks 1963 Katalina Sharkey de Solis 1981 A brief report on the intended marriage of Ashley and Katalina on 5 September 2015 in Oxfordshire. 5.142423 - QVD India Hicks 1967 If you would like to spoil yourself in Harbour Island, Bahamas why not try this? 5.143 Prince Alexander "Sandro" of Battenberg 1857 1893 Johanna Loisinger 1865 1951 Prince Alexander was elected Prince of Bulgaria in 1879 and after strong pressure from Russia was forced to abdicate 1886 . He took the title Count von Hartenau on his unequal marriage in 1889 and died of Appendicitis. Death report on Prince Alexander. 5.144 Prince Henry "Liko" of Battenberg 1858 1896 Princess Beatrice of Great Britain 1857 1944 See 1.9 - Henry died from malaria fever contracted in Africa whilst participating in the Ashanti expedition and died at sea. His body was preserved in rum and brought back to England for burial in St Mildred's Church, Whippingham, Isle of Wight. An alternative report on his death. A detailed report on the wedding of Prince Henry and Princess Beatrice . 5.1441 - QVD Prince Alexander "Drino" of Battenberg 1886 1960 Lady Irene Denison 1890 1956 Alexander was created Marquess of Carisbrooke and the family name changed to Mountbatten in 1917. 5.14411 - QVD Lady Iris Mountbatten 1920 1982 Michael Neely Bryan 1916 1972 The marriage of Iris Mountbatten and Michael Neely Bryan only lasted a couple of months. Michael Neely Bryan was an American Jazz musician who played with the likes of Benny Goodman and Artie Shaw and at one time did deeds that perhaps he shouldn't have? 5.1443 - QVD Prince Leopold of Battenberg 1889 1922 Leopold's family name was changed from Battenberg to Mountbatten in 1917 and he took the title of Lord Leopold Mountbatten. Leopold suffered from haemophilia and died following an hip operation. 5.1444 - QVD Prince Maurice of Battenberg 1891 1914 Maurice was killed by an exploding shell while leading an attack on the Belgian frontline near Ypres in World War 1. At his mother's (Princess Beatrice) request, he was buried among his comrades in a cemetery in Ypres. Some further details of his death. 5.15 Princess Marie of Hesse and by Rhine 1824 1880 Emperor Alexander II of all the Russias 1818 1881 See 4.91 - Marie took the name "Maria Alexandrovna" on her marriage. Emperor Alexander was assassinated in St Petersburg by a terrorists bomb. 5.2 Prince Luise Karoline and by Rhine 1779 1811 Prince Ludwig of Anhalt-Köthen 1778 1802 . 5.22 Duke Louis Augustus of Anhalt-Köthen 1802 1818 Louis Augustus was born posthumously, four days after the death of his father, on 16 September 1802. Louis Augustus succeeded his childless uncle Augustus Christian Frederick (died 5 May 1812) as Duke of Anhalt-Köthen. Louis Augustus was only sixteen years of age when he died and he was succeeded by his first cousin once removed Prince Frederick Ferdinand of Anhalt-Köthen-Pless (1769–1830) as Duke of Anhalt-Köthen.